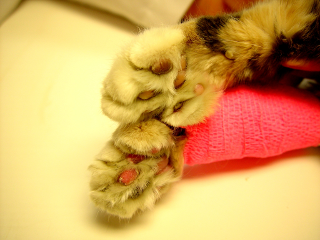 Cat showing cyanotic foot pads due to an aortic thromboembolism (ATE). Generalized weakness may occur secondary to heart disease or may be caused by a variety of other illnesses. In animals with heart disease, weakness is caused by a decreased amount of blood being pumped by the heart to the rest of the body. This may be due to an abnormal rhythm (arrhythmia), an obstruction in the blood flow (seen in diseases such as Pulmonic Stenosis, Subaortic Stenosis and Hypertrophic Cardiomyopath), a decrease in contractile or pumping function of the heart, or pericardial disease. In cats, the most common cause of rear limb paralysis is a clot that goes to the back leg, also called a saddle thrombus or arterial thromboembolism. A clot lodging in the back leg is often a result of heart disease, and this results in the sudden appearance of hind leg weakness, sudden paralysis, limb pain and cold rear legs. A clot in a cat is most commonly seen affecting both rear legs but also may affect only one rear leg, a front leg or other parts of the body. The development of a clot to one or more limbs is an emergency situation and veterinary care should be sought immediately.